The Simpsons has proved to be quite good at predicting the future. There was that one time when Homer nearly calculated the mass of the Higgs boson particle. And remember when the show foreshadowed the St. Louis Cardinals hacking scandal? More recently, the internet lost its collective marbles when Star Wars: The Force Awakens and Alvin And The Chipmunks: The Road Chip opened on the same day, eerily similar to a freeze-frame joke from 2009’s episode Homer The Whopper. Still, it’s difficult to imagine the animated series knew it would one day inspire the creation of a whole lot of baked goods. Last year, an entire episode of Food Network’s Cake Wars showcased four professional bakers whipping up Simpsons-themed cakes for a chance to win $10,000 and have their cake presented/eaten at an official Simpsons party. The cakes paid homage to classic episodes like “Deep Space Homer,” “Marge Vs. The Monorail,” and “Burns Verkaufen Der Kraftwerk”(featuring the scrumptious land of chocolate sequence). All in all, the cakes from the show were pretty neat (even though the artists were under strict time constraints) but none of them came close to the work of Kylie Mangles. In 2014, the Vancouver-based baker’s Ralph Wiggum cutout cake, inspired by the artwork of Erick Flores, went viral. And now Mangles has returned with a fresh design by artist Ephin Cozmo. 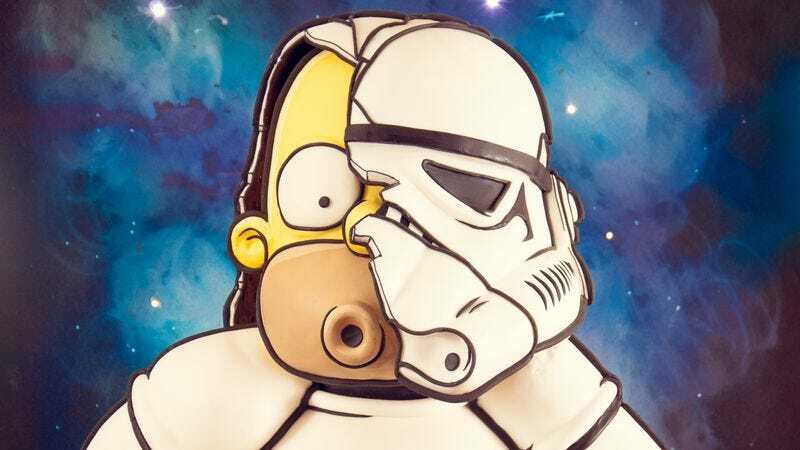 The new cake puts Homer Simpson in stormtrooper armor and looks absolutely delicious. The cake’s flavor itself is called Tasty Tatooine Tangerine and there’s even an artsy video illustrating some of the steps Mangles took to create this fictional crossover dessert.